Check us out on Facebook: The Lima Astronomical Society. The Star Gazer is written by Sherry Cottle Graham. Please forward comments, suggestions, or to unsubscribe/subscribe to this newsletter to SherryCottle@gmail.com. 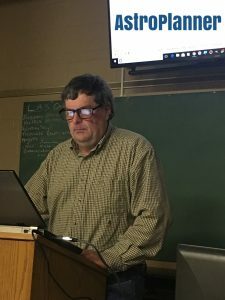 June 1, 2018 John Thomas, an officer of The Astronomical League Great Lakes division, will present the benefits of becoming a member. He will also be answering questions. 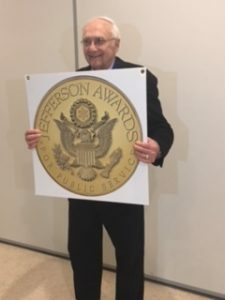 Click the following link to watch Earl Lhamon’s interview with the WLIO television for his Jefferson Award that he won. The Lima Astronomical Society was given a check for $350.00’s by the United Way as part of his award. 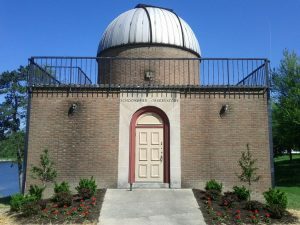 The Schoonover Park Observatory is open to the public every so often, giving visitors a glimpse of the spectacular night sky. On April 9th, 2018 the Schoonover Observatory was voted by the prestigious Cleveland.com as the most beautiful place in Allen County. Michael Ritchie, The Lima Astronomical Society’s Vice President, has been working with the Cleveland Plain Dealer for the previous two months with them to earn this distinguished award. Click this to link to the site. When David Burger, Lima’s Mayor, learned about this recognition, he invited members of our board to join him on his Wednesday’s Media Announcement. David Humphrey’s, LAS President, appeared on WLIO TV on April 18th where he talked about this award. David Humphreys said, “I attended the Mayor’s weekly press conference where the mayor recognized the Observatory’s recognition by the Cleveland Plain Dealer as being the most beautiful place in Allen County for the Plain Dealer’s list of most beautiful places in each of Ohio’s 88 counties. There were only 3 media outlets represented and each one got a copy of the notes from the mayor’s office about the events being represented at the meeting. When the Mayor recognized the observatory during the meeting, I was invited up and spoke for 3 to 5 minutes about the recognition, the observatory, our summer schedule and a few other things. Ric Stolly, Lima Parks and Recreation Director, has been instrumental this past season with his efforts to upgrade the observatory. His along with the LAS members and community sponsors, many improvements have happened over the course of this past year to improve the appearance and the quality of stargazing. The Lima Astronomical Society is open every Friday night at dusk to the public. Stargazing will take place when the sky permits, but rain or shine, a program will be offered in the meeting room. Please mark your calendars to glimpse the beauty of a distant star or galaxy at the Lima Schoonover Observatory on a clear Friday night at dusk. When you go out and look up in the sky for the first time with your first telescope, the sight that you see is a bit overwhelming for beginners. But for members of the Lima Astronomical Society, they have solved this dilemma. With the click of a few keystrokes, they quickly become masters of their universe. Mark Casazza and David Humphreys demonstrated how to use various types of stargazing software which improves the success of their outings. With billions of heavenly objects that surround our planet, it makes sense to approach this task with a little help from these tool sets. David Humphrey’s gave a short demonstration of an application that is called “Astroplanner”. He uses this program both at home and at the observatory to create his viewing schedules. After seeing what these applications can do to help the stargazer to determining what is in the night sky, these programs are truly an astronomer’s best friend. at the Lima Observatory’s April meeting. May 6, 7– Eta Aquarids. The Eta Aquarids is an above average shower, capable of producing up to 60 meteors per hour at its peak. Most of the activity is seen in the Southern Hemisphere. In the Northern Hemisphere, the rate can reach about 30 meteors per hour. It is produced by dust particles left behind by comet Halley, which has known and observed since ancient times. The shower runs annually from April 19 to May 28. It peaks this year on the night of May 6 and the morning of the May 7. The waning gibbous moon will block most of the fainter meteors this year, but you should be able to catch quite A few good ones if you are patient. Best viewing will be from a dark location after midnight. Meteors will radiate from the constellation Aquarius, but can appear anywhere in the sky. May 9– Jupiter at Opposition. The giant planet will be at its closest approach to Earth and its face will be fully illuminated by the Sun. It will be brighter than any other time of the year and will be visible all night long. This is the best time to view and photograph Jupiter and its moons. A medium-sized telescope should be able to show you some of the details in Jupiter’s cloud bands. A good pair of binoculars should allow you to see Jupiter’s four largest moons, appearing as bright dots on either side of the planet. May 15– New Moon. The Moon will located on the same side of the Earth as the Sun and will not be visible in the night sky. This phase occurs at 11:48 UTC. This is the best time of the month to observe faint objects such as galaxies and star clusters because there is no moonlight to interfere. May 29– Full Moon. The Moon will be located on the opposite side of the Earth as the Sun and its face will be will be fully illuminated. This phase occurs at 14:19 UTC. This full moon was known by early Native American tribes as the Full Flower Moon because this was the time of year when spring flowers appeared in abundance. This moon has also been known as the Full Corn Planting Moon and the Milk Moon. General Meetings for 2018 are on the first Friday of each month starting at 8:00 P.M.
May 9th, Elida M.S., LAS will present Basic Astronomy to their 5th grade classes. Perseids Meteor Shower, August 12-13, 2018 starting at dusk, at Kendrick Woods. 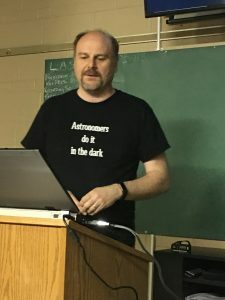 Astronomy Days #2, October 13, 2018, from Noon to Evening, at Lima Schoonover Observatory. International Observe the Moon, October 20, 2018, starting at 6 P.M. at Kendrick Woods. 50th Anniversary of the Apollo Lunar Landing, May 4th, 2019 at the Neil Armstrong Airport. Night Out at the Neil Armstrong Museum, May 19th, 2019. Click this link to go to the article that is online. A new study has uncovered a dozen stellar-mass black holes within 3 light-years of the supermassive black hole at our galaxy’s core — and these might be just the tip of the iceberg. This artist’s rendering shows our galaxy’s supermassive black hole surrounded by dust, gas, and 12 stellar-mass black holes. The inset shows that each black hole is paired with an ordinary star. A trickle of gas from the star feeds the black hole via an accretion disk, which emits an X-ray glow. We’ve long known that a supermassive black hole with more than 4 million times the Sun’s mass lurks in our galactic center. Now, a study published in the April 5th Nature makes the case that the behemoth isn’t alone. Potentially, 10,000 or so stellar-mass black holes might be keeping it company. The black hole population — if it’s real — would match theoretical predictions that lots of massive things ought to end up in our galaxy’s center. Indeed, the Milky Way’s core is already a crowded place: More than 30 magnitudes’ worth of dust and gas block our view in visible light. The only way to peer into our galaxy’s enshrouded core is by going either very low (radio observations) or very high (X-rays or gamma rays). Charles Hailey (Columbia University) and colleagues chose to go high, basing their results on 16 days’ worth of observations that the Chandra X-ray Observatory collected over the past 12 years. The astronomers then looked at how much radiation these sources emit at different energies: It’s a bit like putting light through a prism to see a rainbow, but the rainbow in this case is at X-ray wavelengths. And, surprisingly, the astronomers found that 12 of the 26 sources nearest the supermassive black hole tend to have “bluer” X-ray rainbows — that is, they’re relatively brighter at higher X-ray energies. Most X-ray emitters in our galaxy’s center are white dwarfs that siphon gas off of ordinary stellar companions, radiating “redder” X-ray rainbows in the process (with more energy emitted at lower X-ray energies). But the new, “blue” X-ray sources appear to be binaries with something more massive — either neutron stars or black holes — made visible by the trickle of X-ray-emitting gas that feeds them. A Chandra X-ray image of the galactic center is overlaid with circles around unresolved X-ray sources. Red circles indicate white dwarf binaries, which typically emit more low-energy X-rays, while cyan circles indicate likely black hole binaries, which emit relatively more high-energy X-rays. The yellow and green circle represent a region between 0.7 and 3 light-years from the black hole. Hailey and colleagues argue that the sources don’t exhibit the outbursts characteristic of neutron star binaries, so they’re more likely to be black holes. Long-term monitoring of the galactic center has found nearly all the neutron star binaries by their outbursts, so it must be the black hole binaries that remain, quietly orbiting their stellar companions and feeding off just enough X-ray-emitting gas that we can (barely) see them. If that’s the case, then these binary black holes would be the tip of the iceberg. Many more isolated black holes could exist in the galactic center, and we wouldn’t see them at all. How many depends on how these black holes came to be there, a hotly debated question. If they are tidally captured stars, then there could be 10,000 — maybe even more! — black holes in the galaxy’s core*. But — and this is a big but — it could be that not all of these sources are black holes. Moreover, they might not have formed in their current orbits. Astronomers have long been looking for quickly rotating neutron stars known as millisecond pulsars in the galactic center, which are widely thought to be captured from globular star clusters passing through the galactic center. One of the reasons finding these pulsars is so important is that they could be to blame for the weirdly large amount of gamma rays that the Fermi telescope has observed radiating from the galactic center. While some astronomers have suggested that the signal might be the long-awaited signature of dark matter particles, millisecond pulsars present a less exotic (read: more easily accepted) option. “That potential dark matter detection has driven people to do these really ambitious millisecond pulsar searches,” says Daryl Haggard (McGill University, Canada). “But they haven’t yielded anything so far.” It remains unclear whether that’s because they’re not there, or they’re just hard to find: Probing the galactic center at radio wavelengths is like looking for minnows in a turbulent and murky river; swirling streams of plasma often obscure the view. Hailey and his team acknowledge that as many as half of their new-and-blue X-ray sources could be the sought-after millisecond pulsars. That would mean there would be fewer isolated black holes, maybe only several hundred instead of thousands. Even so, that’s still an awful lot of massive stellar remnants hiding in our galaxy’s center. “In either case, it’s still interesting,” Haggard says, adding that future radio studies could help distinguish between black holes and neutron stars. Then we can start to get at the question of how these objects got there in the first place. * In case you’re wondering: No, these black holes aren’t the dark matter we’ve been looking for. The amount of dark matter in the galaxy’s core would actually be quite small — most of it extends farther out than the Milky Way’s spiral-shaped disk. Also, since black holes used to be stars, they would have at one point been made of normal, baryonic particles, and we have good evidence that dark matter, whatever it is, isn’t baryonic. Monica Young, a professional astronomer by training, is news editor of Sky & Telescope. Mission Statement: To promote knowledge of astronomy and science (in general) for the residents in and around our community. Membership Renewals for 2018 year are now due. Please send your checks to: Lima Astronomical Society, Box 201, Lima, OH 45802. The price is: Student $15: Individual $20: Family $25: Life Time $300.